The National Day of Action has been canceled. 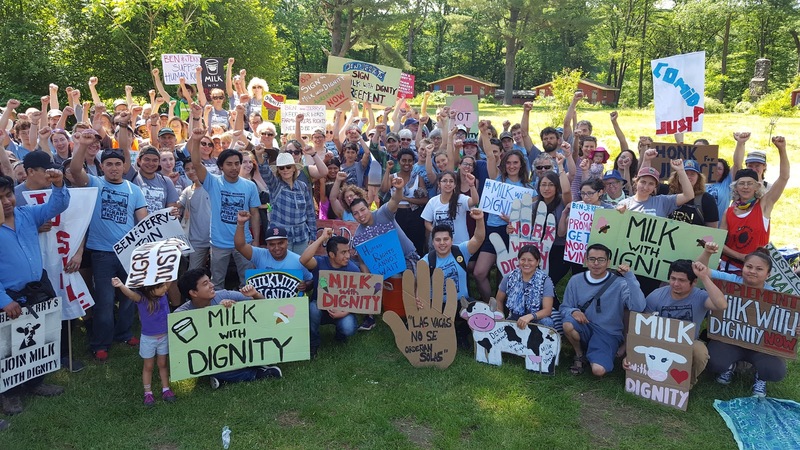 Read about the historic agreement between Migrant Justice and Ben & Jerry's. Burlington, VT. 5pm. Meet at top of Church St, march and rally at Ben & Jerry's. Washington DC. 6pm. Ben & Jerry's in Georgetown at 6pm. New Haven, Connecticut. Ben & Jerry's. Directions, join and share on Facebook here. South Deerfield, Mass. 5pm, Ben & Jerry's. Sarasota, Florida. 5pm. Ben & Jerry's in Sarasota. New York, New York. 6pm. Ben & Jerry's Times Square. Brattleboro, VT. 11am. Brattleboro Food Coop. Philadelphia, Pennsylvania. 5:30pm. Upenn/West Philly Ben & Jerry's. Rutland, VT. 5pm. Ben & Jerry's in Rutland. Boston, Mass. Boston College. TBA. September 19, North Hampton, MA, 6pm. Pioneer Valley Worker's Center (Jobs with Justice). September 13, New York City. Columbia Law School, 12:10-1:10 pm. Facebook event here.